Even when you’re at home, a map can really help you know where you are. 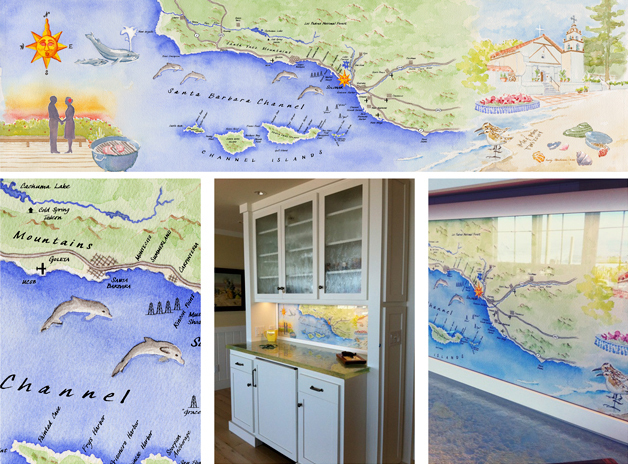 A customer with a family home on the Pacific ocean wanted to include a map of the area in a new bar backsplash. His dad has always had a nautical chart pinned up behind the bar, and used it to point out to guests what they were seeing when they looked to the horizon during sunset cocktail hour. The new bar area would be completely rebuilt during the remodel, but the family wanted to be able to continue this tradition while remembering the old days. I designed the commissioned map to fit the architects’ and cabinet makers’ specifications. The pencil version, above, shows where the image would be cropped and framed. The interior designer’s color palette informed my work as I mixed the watercolors. Alongside the featured coastline, I illustrated details from the family’s life. The grandparents can now always be remembered standing on their deck during sunset. Nearby Mission San Buenaventura is shown, along with two sandpipers the family has come to know and love. This was a fun project for lots reasons. The architect for the remodel was Mary Andrulaitis, one of my classmates from architecture school who is now a partner at Neumann Mendro Andrulaitis Architects. I got to visit Mary in Santa Barbara, meet her family, and visit the job site where I could see where the map would go and what could be viewed from there. The clients were fun to work with and were delighted with the end product. I’m looking forward to taking them up on that sunset cocktail next time I’m out there.